Over the weekend, we visited the Austin Pet Expo here in town. There were lots of animals and vendors. We shared part one of our expo visit yesterday. You can read it here if you missed it. I decided to break our pet expo adventure up into two parts since I have so much to share about it. 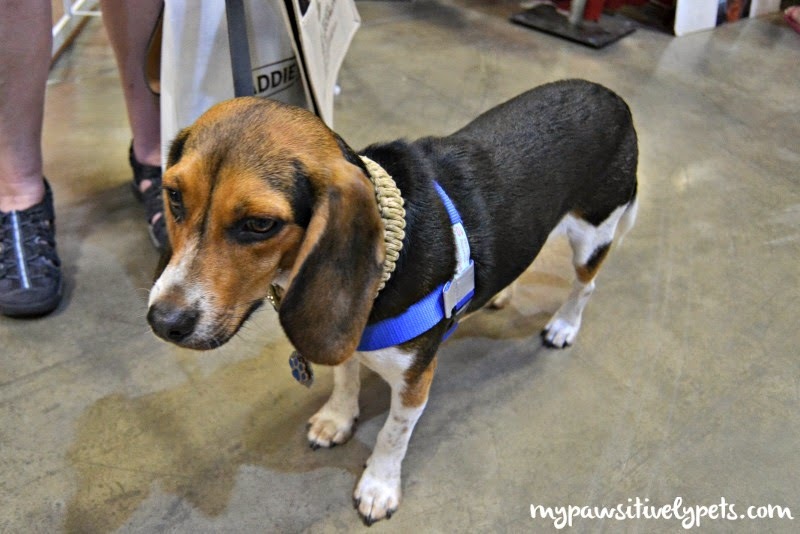 Today, I wanted to share the awesome pet bloggers that we got to meet at the expo. I have never really had the opportunity to meet any pet bloggers in person, so it was an awesome experience. The first blogger that I got to meet was Liz from the blog For the Love of Beagle. 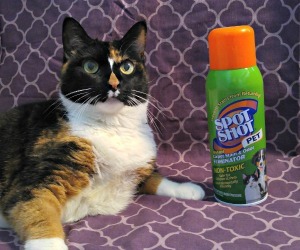 Liz is a pet blogger from San Antonio who also owns Snaggle Foot Dog Walks & Pet Care. She's a dog walker and pet sitter that offers a variety of services. If you're in San Antonio, you should check out Snaggle Foot. Dexter from For the Love of Beagle. I've been following For the Love of Beagle for a few months now and am happy to have connected with Liz in the real world. Liz brought along her adorable little beagle Dexter. Can I just say that I love Dexter? He was so sweet and well mannered. And not to mention super handsome. I also got to meet Preston from Preston Speaks and his human mom, Rachel. I met them briefly last year when I attended too. It was nice to meet a fellow Petties Award nominee. Preston Speaks is in the running for Best Dog Blog this year. My daughter has been a fan of Preston's since last year. She has been asking me for weeks if Preston was going to be at the expo again this year. The final pet blogger that I got to meet was Christy from Sassmuffins. 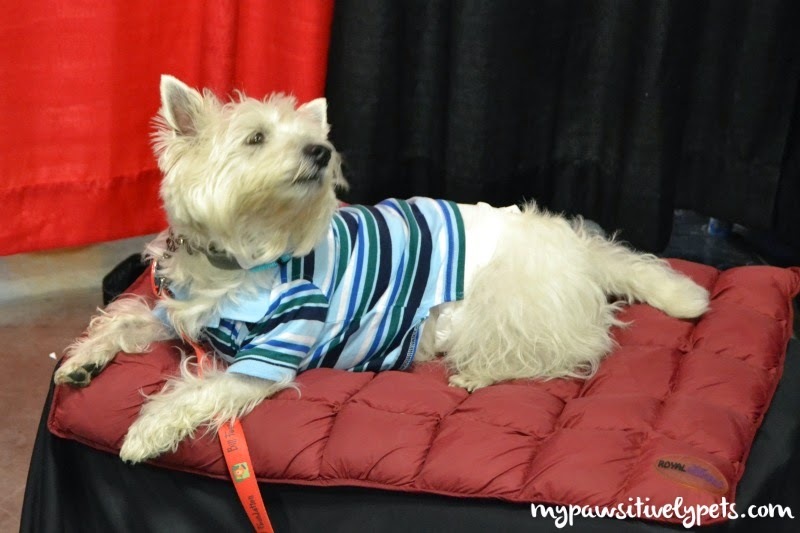 Christy had a booth at the expo to showcase her gorgeous pet beds. I have been following Christy's blog at Sassmuffins for at least a year now I think. It's been a long time, so it's hard to remember exactly. Part of the Sassmuffins display. We chatted with each other for quite a while. I felt bad taking up so much of her valuable expo time, but I felt like we could have probably chatted for a very long time. I should have taken some more photos of her stuff, but I was too busy talking. Let me just say that Christy's pet beds are top notch! I don't know how to sew, but my mother does and she was pretty amazed with Christy's beds. She makes a lot of other cool things too, like toys, bandanas, and blankets. Photos from Sassmuffins' website because I was too busy talking to take pictures. She also had some bandanas for sale that were pretty cool. First of all, they are super cute. They attach to your dog's collar and come with a QR code sewn onto the back. You can make a special video or voice recording that can be viewed when you scan the QR code with your phone. I thought it was a brilliant and creative idea. 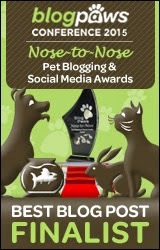 And that's it for the pet bloggers that I got to meet this year. Hopefully I will meet them again in the future. Maybe even next year when we attend again. I thought so too! Hopefully you can meet a blogging pal one day. Those bandanas seem so cool! I'll have to look into the bloggers you mentioned :) Thanks for sharing! She got some toys to play with lol, but they've already been destroyed. Mostly, I got some stuff for Lily and I found a Pokemon rat bottle from the rat rescue. Glad you had such a good time at the Expo. What fun to meet some bloggers. Those bandanas do look really nice. Have a great Tuesday. 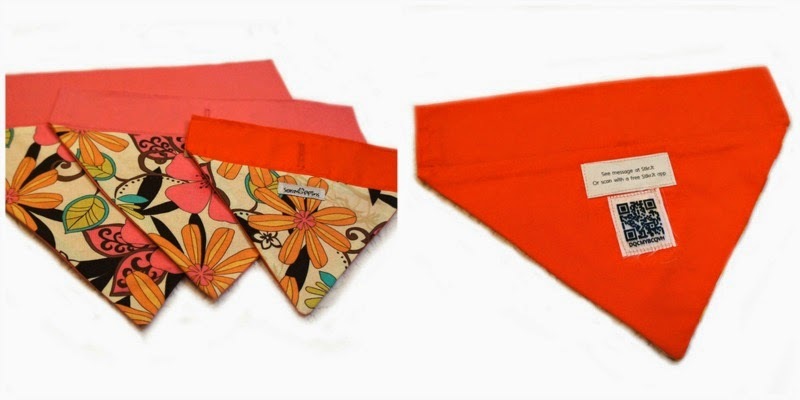 Cool bandana's! Looks like you guys had a ton of fun! What fun!!! It's always nice to meet your blog furiends! Especially by surprise! I agree, meeting other bloggers is always lots of fun! Our expo is in November and I am already excited for it. Love the bark and retirement place, what a lovely idea! How great! Sounds like a fun event and great opportunity to meet other bloggers. 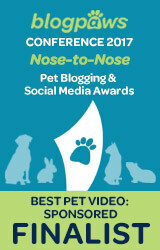 That would be fun to meet other pet bloggers at the expo. We only met one at the second expo we went to, but it was also pre arranged. These were mostly pre-arranged too. I knew Preston and Christy both had booths there for a long time before we went. And I talked to Liz before I went. What a great event! 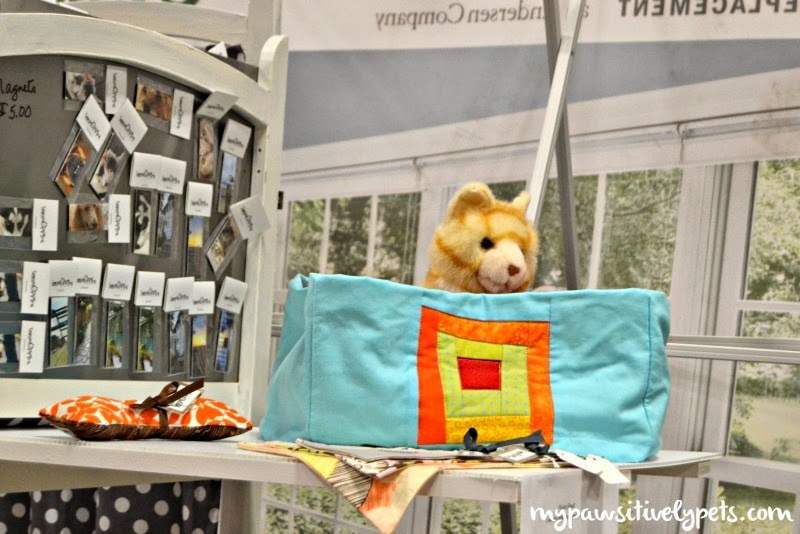 I just read both posts, and it looks like there was such a great variety of vendors and animals, and what fun to get to meet some other bloggers. You are so lucky to live in an area that has a pet expo like this (we have nothing here). Ann, it was so great to finally meet you (and your Mom and daughter)! And you definitely did not take too much of my time; I really enjoyed the visit. I am glad you enjoyed my booth and products. I think those bandanas were my best seller for the day. I am so excited that I finally have something to offer bigger dogs like Shiner, since I don't make large pet beds. Thanks so much for the lovely review and I hope to meet you again! I will have to order her a bandana one of these days! And I know where to go if I ever need a cat bed in the future. It was awesome meeting you too! What a fun event. And it's always so much fun to meet other bloggers...that's what our mom says. We're glad you had the opportunity. way kewl ya getted ta meet other bloggerz !!! N de bandanas R rockin,,,,anda veree clever eye dea !!! How neat that you got to meet a few of the pet bloggers that you follow! This expo sounds awesome. I googled it, and there IS one in Atlanta in November. I've already added it to my calendar. Can't wait! I was thinking there might be one there because the Amazing Pet Expos travels all over the US throughout the year. Glad you had such a great time! How cool that you got to meet Preston and Dexter! I go to the Great Indy Pet Expo each year, but I think yours is better! I certainly hope that we get to meet next year! It looks like a blast!! Or even visit current ones as much as we'd like! Thanks for not giving up on us BTW. Our mom's workload has been so heavy, it's been almost painful, and she's had NO time for anything. Thankfully she knew in advance how bad July/August would be, so she prescheduled a zillion blog posts for us in a marathon weekend! But we HAVE been voting for you every single day to win a Pettie!!! Thanks guys! I have also been voting for yall everyday. Good luck! I know if blogging wasn't my day job, I wouldn't have time to visit either. I barely have time to visit other too much as it is, but I try to get in as much as I can. I love expos! In fact, I've gotten the entire family into going with me. I need to start venturing out of our immediate area once or twice a year to meet other bloggers too! Sounds like you had a great time!